The past month has been tough on Amazon (NSDQ: AMZN) founder Jeff Bezos. On February 1, Amazon shares fells 5% after the company released Q4 results that included a 20% jump in sales to more than $72 billion. However, that good news was torpedoed by revenue guidance for 2019 that suggests its core e-tail business is starting to slow down. In January, Bezos disclosed that he and his wife are divorcing after 25 years of marriage. But I guess when you have a net worth north of $100 billion, giving up half that amount to your soon-to-be ex-wife may not seem like such a big deal. With the $50 billion or so that Bezos will have left to his name after the divorce, he should be able to make ends meet. However, there may be more to this story than meets the eye. In theory, it should not affect the future value of Amazon stock or the projects the company is working on, but history suggests otherwise. Life changing events have a profound effect on the involved parties, often causing them to rethink their priorities. As unlikely as it may seem, the Bezos divorce may eventually intertwine with the recent federal government shutdown. The common thread? Amazon’s plans to build a second headquarters near Washington, DC to be called “National Landing” in an area currently known as Crystal City. I believe that development may only be the first step in a long-term plan that would elevate Bezos’ legacy to something far greater than being simply remembered as the guy that revolutionized the retail industry. I happen to live only a few miles from Crystal City, and my wife works there for a government contracting firm. In fact, about half the people employed in Crystal City work for either the military, a federal agency or a government contracting firm. The rest mostly work in service industries to support them. If he hasn’t figured it out already, Bezos will quickly realize that the government contracting business could be quite lucrative for Amazon. 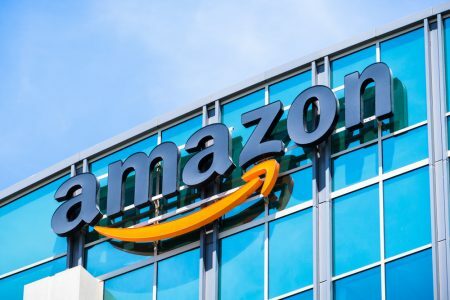 By that, I am not referring to Amazon’s traditional business of selling merchandise online or managing cloud content from its Amazon Web Services (AWS) platform. He’s already doing that. As the recent government shutdown illustrates, much of the mundane, but essential business of government can quickly grind to a halt once its rank-and-file workers stop reporting to work. Except, that is, for work performed under government contracts that have already been funded. At the moment, much of that work is related to military and defense projects supporting national security. However, there is no good reason why most of the grunt work performed across most federal agencies could not be outsourced. Sure, the union would have a huge problem with that and put up one heck of a fight. But if the government shutdown resumes on February 15 when the temporary funding bill expires, public opinion may sway in favor of taking the threat of a shutdown away as a political weapon. Amazon would be a natural to take over that business. The thing that the company is best at — managing extremely complex logistical systems — is precisely what most federal agencies need the most. Within 10 years, Amazon will have 25,000 highly skilled employees working at its massive complex within a few miles of the White House. Bezos may decide that instead of figuring out more ways to beat up on hapless mall merchants, his time would be better spent becoming the federal government’s de facto logistics manager. The government contracting business shares the same key structural element that attracted Bezos to the retail sector in the first place. It is highly fragmented with thousands of small providers that enjoy very few economies of scale. That may be good for national security since no one entity has too much control of the government’s business. However, it’s not so great for economic efficiency. At some point, Congress may feel the only way to get the federal deficit under control is to improve efficiency. One way to do that is to outsource the logistical management aspect of all federal agencies to a single entity such as Amazon. Of course, dozens of huge government contracting firms would argue they are in place and prepared to take on that business. However, there would be a huge conflict of interest between that business and the various contracts on which they are working. The only way to avoid that problem altogether is to use a company that is not already in the government contracting business. To be clear, I don’t expect this to happen soon. The federal deficit is projected to swell by nearly $2 trillion over the next couple of years. Consequently, interest rates on the Treasury securities that finance the budget will start to increase rapidly. As that happens, the economy could quickly slide into a deep recession. I estimate that it will take about five years for financial pressure to build to the point that the government will be ready to consider a major change to how its agencies are structured and staffed. Coincidentally, Amazon’s new HQ2 in Crystal City should be coming online at about the same time, located squarely in the geographic epicenter of the government contracting business. Five years from now Jeff Bezos will turn 60. As someone who is only a few months away from achieving that milestone age, I have found myself thinking about what sort of legacy I will leave behind for my children and future generations. I imagine Bezos will find himself wondering the same thing. In his case, Bezos has created a platform from which he can choose whatever legacy he finds most appealing. It may also turn out to be the one that is most profitable for Amazon in the long run. There’s another man whose decisions profoundly affect the nation’s capital. His name is Donald J. Trump. Just as Amazon could be on the verge of opening a new investment opportunity, so too is the president of the United States — an opportunity to the tune of $287,000. Give us the next 10 minutes and we’ll show you exactly how it works… Click here now.